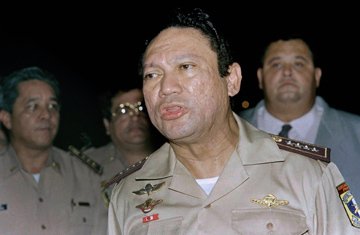 Manuel Noriega may have once been cast as an archvillain in a tale of narcotrafficking and authoritarian brutality, but the former Panamanian dictator looked more like a victim as he awaited his fate, stooped and slightly shaking, in a Paris courtroom on Wednesday. A French judge sentenced Noriega, 76, to seven years in prison and a €10 million fine for laundering drug money in France during the 1980s by buying luxury apartments in Paris; she also ordered his assets in France to be seized and demanded that he pay more than €2 million in legal expenses. That's an extraordinarily severe sentence for an ailing septuagenarian who has spent the past 17 years in a Miami jail, says Noriega's French lawyer Yves Leberquier. Leberquier believes the French prosecutors offered weak evidence and that there was no proof that the apartments were purchased with drug money. Still, back in Noriega's home country, many believe the former general got off lightly. "The former dictator faces much more serious charges in Panama," says Miguel Antonio Bernal, professor of constitutional law at the University of Panama. While many young Panamanians have little memory of Noriega's ironfisted rule, Bernal says many others want him in jail on home soil. He may have run a brutal dictatorship, but Noriega was on the CIA payroll and was a crucial U.S. ally in the regional dirty wars against leftist movements in Nicaragua and El Salvador during the 1980s. He also became one of the world's biggest drug kingpins, and as the Cold War waned, he found himself wanted for cocaine trafficking in the U.S. Noriega's eight-year rule finally ended when he surrendered himself to the U.S., which sent thousands of troops to invade Panama in 1989. While Noriega languished in a Miami jail, a French judge sentenced him in absentia to 10 years for money-laundering, and Panama's judges convicted him on charges of murder and human-rights abuses that were committed while he was in power. He remained in the Miami prison after his sentence ended in 2007, while fighting extradition requests from France and Panama. But in April, U.S. Secretary of State Hillary Clinton signed Noriega's extradition to France, after the Supreme Court declined to hear his case. "The crucial issue was of course politics," said Noriega attorney Antonin Levy. "[U.S. officials] will do everything possible to let him stay inside a jail and not go back to Panama." His lawyers say that U.S. officials fear a Noriega return might stir up old hostilities, and also lead to disclosures that could embarrass some current and retired officials. U.S. officials reject that claim, insisting that Noriega's extradition was a legal matter based on an existing treaty. Still, Noriega could be home as early as next year. French law stipulates that the 32 months he spent in jail in Miami and Paris since his U.S. sentence ended in 2007 will be automatically deducted from his seven-year sentence. He can also apply to be paroled after he has served half his French sentence, which would be 3½ years. His health is likely to weigh in his favor; he suffered a stroke while in Miami, and is on medication for high blood pressure. Both Noriega's old foes and allies will be waiting for his return. Bernal says there are still officials in the government and security forces that owe favors to the former strongman. Those people, says the law professor, will likely ensure that Noriega can live the rest of his life in relative peace. Panama's criminal law was amended in 2008, giving judges discretion to order convicts older than 65 to serve their sentences under house arrest rather than in prison. The law, passed shortly after Noriega ended his Miami sentence, was widely assumed to have been drafted for the general, and Panama's President, Ricardo Martinelli, recently said he would like to see Noriega serve his sentence under house arrest. One other factor might persuade Panama's government to allow Noriega an easy return: few in government relish a rehashing of Panama's bloody history in court. "Noriega was the only one who was jailed for all of the abuses that occurred in Panama, but he didn't act alone," says Bernal, adding, "It is as if they took Ali Baba but left the 40 thieves." And it's safe to assume that the 40 thieves would like to keep it that way.